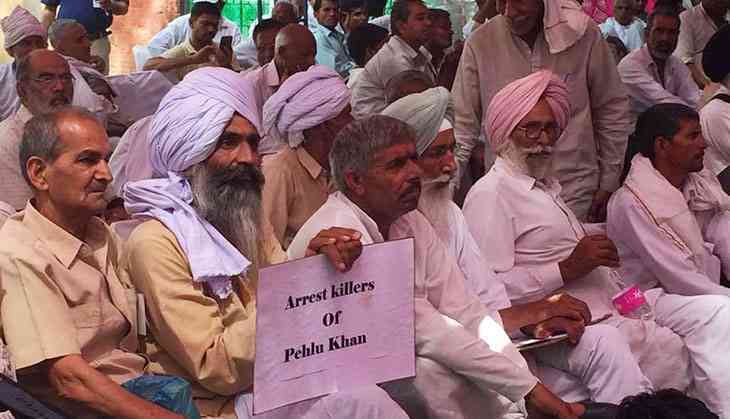 Never did she imagine that her first visit to Delhi would be to join a mass dharna demanding justice for her 55-year-old son Pehlu Khan, who was lynched by self-proclaimed gau rakshaks in Alwar district of Rajasthan. Meet 85-year-old Angoori Begum who has for the first time travelled all the way from Jaisinghpur village in Nuh district of Haryana to the national capital. Having no vision in either eye, she has even lost her hearing and has only been crying ever since her son was killed. “She was never talkative but ever since Pehlu died, she has stopped talking completely. She didn't even want to come here and it was only after we persuaded her that she agreed,” her grandson and Pehlu's son Aarif Khan, who was also attacked, told Catch. As he continued to speak, Angoori Begum remained oblivious of what her son was saying. Even the loud slogans blaring out of the speakers had no effect on her as she continued to wipe sweat off her severely wrinkled face and arms. Next to her sat Pehlu's youngest daughter, Shabnam, who was trying to entertain her six-month-old son who too seemed to be troubled by the scorching heat. 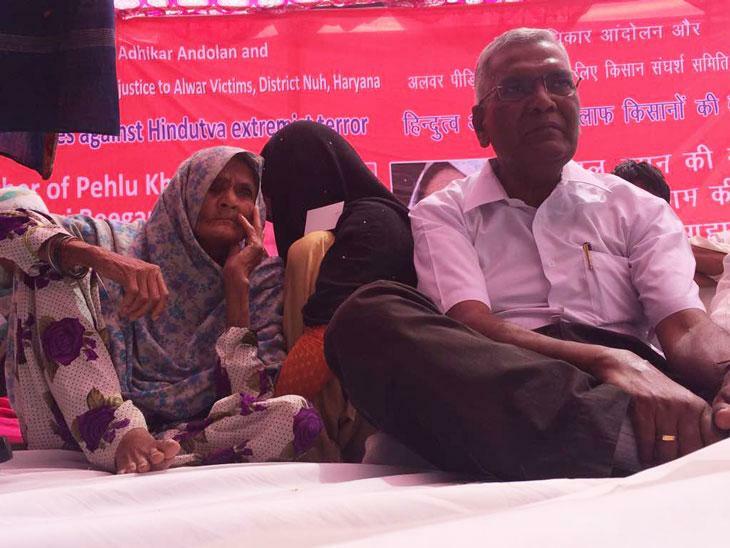 Pehlu's entire family was seated on the dais and would occasionally clap when various speakers spoke about justice being given to the family. Meanwhile, the family remains clueless about what is being done to their cows that were taken away from them. “The last I heard they were at some gau shaala in Behror where the incident occurred. We don't want the cows that led to the killing of my father, those gau rakshaks can keep them,” Aarif claimed. Azmat Khan, who was accompanying Pehlu on the day of the attack couldn't attend the protest as he is still recuperating from his injuries. “He still can't walk because of the injuries on his spine. People have to carry him if he has to go to the toilet otherwise he too would have joined this dharna,” said his brother Arshad Khan. He had a suggestion for Prime Minister Narendra Modi and said that he should follow his words of sabka saath, sabka vikas and ensure that no such incident happens in the future. “Or else the government should take back our cows as someone else might get killed for just keeping a cow. We have lakhs of cows in the region while one should visit the houses of these gau rakshaks and see whether they have any,” thundered Mohammed. Criticising the Rajasthan government for slapping cases against the victims for illegally transporting cows, another member of the panchayat, Mohd Qasim Mewati, claimed that the district collector never issued permits. “Till date no collector has given permits while Hindus are never asked for permits, Muslims are hounded for such permits,” he said. Speaking on these cow vigilantes, he said, they have been doing this for long and only after such an incident happened that people have taken notice of it. “Their only purpose is to loot innocent Muslims and then sell their cows back in the market, We want government to take action strict action so that no other Pehlu loses his life at the hands of these extortionists,” he added. Hundreds gathered at the mass dharna demanding justice to the victims and a compensation of Rs 1 crore be paid to Pehlu's families. 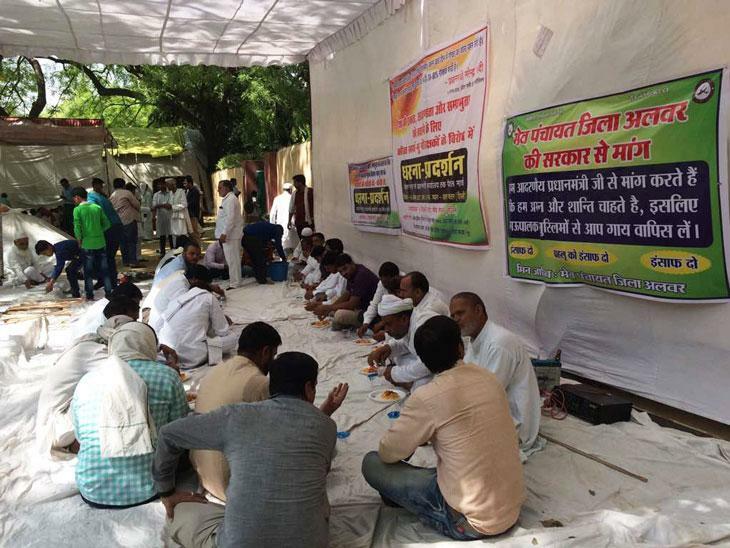 Organised by Bhoomi Adhikar Andolan, leaders of political parties including CPI (M), CPI, NCP, JD(U), CPI(ML) and others, MPs, leaders of trade unions and peasant organizations attended the event. While addressing the crowds, CPI leader D Raja accused the BJP government of creating a new India which resembled more like a vedic India or a Manuvadi India. “This is not the new India that Modi keeps talking about. If Mahatama Gandhi was alive, he would have said Modi aur RSS ko sanmati de bhagwaan. These are not rakshaks but raakshas (demons) and we will not allow such a government to let these fringe elements to operate with complete freedom and political patronage,” Raja added. Echoing similar sentiments, Kavita Srivastava of PUCL said these are not gau rakshaks but nar bhakshaks (cannibals) and demanded that all those named by Pehlu before he died should immediately be arrested while cases filed against the victims should be withdrawn with immediate effect. Women's activist Annie Raja exhorted those present to hit the streets in protest of Pehlu's killing to ensure justice is done. A statement released by Bhoomi Adhikar Aandolan claimed that ever since Modi government came to power the groups affiliated to Sangh Parivar have been trying to incite violence in the name of cow slaughter and cow meat. “Whether it was Mohd Akhlaq's killing in Dadri or Jharkhand's Latehar where two people including a child were killed and hung from a tree or lynching of a truck driver in Jammu or an incident from Dingri in Mewat or flogging of dalits in Gujarat, these incidents have witnessed a spike in the recent past,” read the statement. Calling these organisations as Indian versions of the ISIS and Taliban, the statement said that they are mushrooming in BJP-ruled states. “Instead of sternly dealing with such incidents, the administration is busy in eliminating all evidence,” read the statement. READ NEXT >> Dinakaran bows out, paves way for AIADMK merger. Is this end of Sasikala?